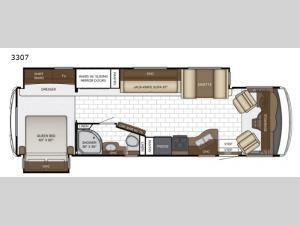 For the retired couple who enjoys traveling at their own pace, then come choose this double slide out 3307 Bay Star Sport class A motor home by Newmar. There are plenty of comforts throughout such as a rear bedroom and a spacious living and kitchen area. Along the roadside there is a full wall slide out with an 87" jack knife sofa. Along the outside wall from the bathroom you will find a dry bar with a TV. At night you will want to retreat to the rear bedroom where you can get a good night's rest on the queen bed plus there is plenty of storage with a dresser and shirt wardrobes.